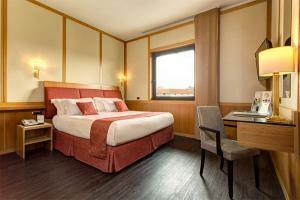 The Best Western Hotel President offers the perfect balance of elegance and functionality in the historic heart of Rome. 187 recently renovated, soundproofed rooms come equipped with flat-screen TVs, minibars and fee Wi-Fi. Larger rooms are available to accommodate families. The hotel features a restaurant serving American and Continental breakfast, as well as delicious Roman dishes and international selections for lunch and dinner. Located about 8 miles from Rome Ciampino Airport. Rome Termini Railway Station is a little over a mile away. The nearest Metro station is Manzoni, about .1 miles from the hotel.